About six months ago, after a visit to the Mother House of the Sisters of the Holy Family in New Orleans, Louisiana, Mrs. Anita Martinez conceived the idea of bringing all the Garifuna religious sisters to Los Angeles to recognize, honor, and celebrate them for their great service to God, our church and humanity. The first thing that Mrs. Martinez did was form a committee of twenty-two talented individuals. She then divided the committee into several sub-committees, and went about the arduous task of identifying and locating the sisters. 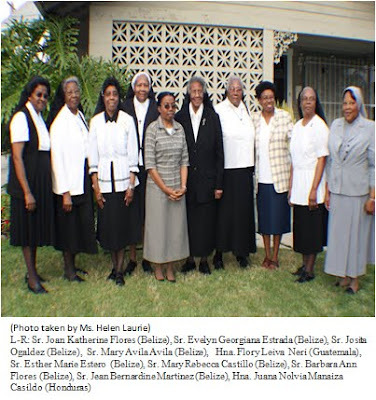 When it was all over, they had located fifteen sisters – ten from Belize: Sr. Joan Flores, Sr. Evelyn Estrada, Sr.Josita Ogaldez, Sr. Esther Marie Estero, Sr. Mary Rebecca Carlos Castillo, Sr. Jean Martinez and Sr. Veronica Ruth Lambey, all Sisters of the Holy Family; Sr. Mary Avila Avila and Sr. Mary Julia Apolonio, both Oblate Sisters of Providence and Sr. Barbara Flores, a Sister of Charity of Nazareth. Four of the sisters hail from Honduras. They are: Sr. Mary Felicia Avila, an Oblate Sister of Providence, Hermana Nolvia Manaiza from the Missionares de Nuestra Senora de la Presentacion; Hermana Maria Euzebia Chebita Avila Benedith, from the Missionara Claretina Religiosos Maria Imaculada, and Hermana Leonarda Martinez Lalin belonging to Hermanas Oblatas al Divino Amor. The only Guatemalan in the group is Hermana Flory Leiva from Livingston, serving in the Hermanas Escolares de San Francisco order. “At first it was difficult rounding up all these sisters because initially I was told that there were no Garifuna religious sisters in Honduras,”said Mrs. Martinez, chair of the committee. “This was hard to accept so I kept asking around until I got the names of Sister Leonarda Lalin and later Sister Nolvia Manaiza and made contact with them,” she concluded. The celebration began with a welcome reception at the home of Mrs. Anita Martinez, where all the sisters had gathered on Friday afternoon, to meet and greet each other, and members of the committee. “It was a joy meeting and reconnecting with my fellow Garifuna Sisters,” said Sister Mary Avila Avila. “Having also celebrated two weeks ago in New York City - a celebration given by my cousin, Claudette Sacasa, and her committee, and surrounded by family and friends, I can truthfully say that this recognition of the Garifuna Sisters here in Los Angeles filled my cup to overflow. What an awesome way to conclude my 50th anniversary. I give thanks to God for all who have supported me in my religious life,” said Sister Avila. At the welcome reception the sisters were treated to a variety of Garifuna and Belizean dishes and delicacies. The next day, Saturday, the community gathered at Saint Frances Xavier Cabrini Church for a Thanksgiving Mass. The celebrant was Father Vincent Musaby'Imana, a priest from Uganda, Africa. He was assisted by three Garifuna deacons - Deacon Alvin Lambey, from the Diocese of Belize, Deacon Harold Sampson, from the Diocese of Brooklyn, New York, and yours truly, Deacon Nieves Hernandez, from the Diocese of Tucson, Arizona. I was also the Homilist. In my homily, I acknowledged each of the sisters individually and shared personal stories and anecdotes about them. I told the approximately three hundred or so well wishers how wonderful it was for a change to honor and celebrate people deserving of recognition, honor and celebrity like our sisters – people who had dedicated their lives in serving God, his church and his people; instead of honoring and celebrating people like movie stars, athletes, musicians and politicians, who were not always worthy to be honored and celebrated. Following the Mass, everyone proceeded to the church’s parish hall where a dinner reception and awards program had been planned for the sisters. The program consisted of performances by local Garifuna artists, and a keynote address given by Deacon Alvin Lambey, who had traveled all the way from Belize with his wife, Eleanor, to attend the celebrations. In his keynote address, Deacon Lambey made the point that although the sisters may not have educated and interacted with all Belizeans, including himself, that their goodness, contributions and hard work had in some way benefited those they did not touch directly through those they were able to touch. He concluded his remarks by thanking the sisters for their hard work and contributions, and wished all of them well. The evening concluded with each of the sisters being awarded a plaque from the committee and each giving a speech. They each expressed their gratitude to the committee for bringing them to Los Angeles to be honored in such a beautiful and meaningful way. The next day Sunday, the sisters were treated to a brunch at Shanghai Red’s Restaurant in Marina Del Rey, California, and then taken on a limousine tour where they visited several historical landmarks in Los Angeles. Following the tour, the sisters were treated to dinner at Mar’s Caribbean Gardens Restaurant in Gardena, California. “The sisters had a wonderful time this weekend,” said Ms. Helen Laurie, a member of the committee, who was responsible for producing the beautiful Thanksgiving Mass Booklets and the Commemorative Brochures. “I am delighted to have been part of the preparations to celebrate these awe-inspiring women of God. It is a blessing to have made their acquaintance and be spiritually inspired by their love and commitment to God and humanity,” she concluded. From the looks of everything the weekend was a success, thanks to Mrs. Anita Martinez and the Garifuna Sisters Recognition Committee, and to all those who in some way, contributed to the success of the celebrations. "Following the Mass, everyone proceeded to the church’s parish hall where a dinner reception and awards program had been planned for the sisters." These women of God have served the people for years. Their life is to serve God's people. I am so proud of each one of them. I am happy that I attended the event. It was very touching. Thanks to Ms Anita Martinez for recognizing that we need to recognize these beautiful women. Linda thanks for sharing this.